Denon unveils AV-Art home cinema range | What Hi-Fi? Denon has taken the wraps off its new 2012 AV-Art home cinema range with the unveiling of its entry-level AVR-1513 (above, £300)/AVR-1713 (£400) models and the midrange AVR-2113 (£550) and AVR-2313 (£800). The multichannel receivers are joined by a new Blu-ray transport, the £450 Denon DBT-1713UD. All the 2012 models "embody a whole new product design concept", says Denon, "with the goal of creating a new kind of user experience: intuitive, clear and simple, both in terms of product design and usability". The result is a cleaner design, fewer buttons on the front panel, and a simpler remote control layout. A large character display makes it easier to read from a distance, and 'quick select' buttones lets users choose their favourite content more easily. Starting at the bottom, the Denon AVR-1513 uses a fully discrete power amp delivering 110W to all five channels. Features include a front HDMI input for easy connection of digital devices such as tablets, cameras and camcorders, along with Dolby TrueHD and DTS-HD Master Audio decoding. A Compressed Audio Restorer helps improve the sound of compressed MP3 or WMA music files. Next up is the Denon AVR-1713, which sees power boosted to 120W per channel. It's also AirPlay and network capable, offering access to thousands of internet radio stations, streaming of music stored on a computer or NAS drive, and playback of music from iDevices using AirPlay. The Denon remote App for iPod, iPhone or iPod Touch allows control of the AVR-1713 fro your Apple portable. An Android app will be reelased later this year. Stepping up the range, the midrange models are the AVR-2113 (above) and AVR-2313. Both feature AirPlay compatibility and 4k video capability, the latter delivering 4k pass-through and 4k scaling through the six HDMI inputs (which also have 3D, Audio Return Channel and CEC functionality). The AVR-2113 delivers 125W across all seven channels, and the AVR-2313 steps that up to 135W per channel. The pricier model also gets twin HDMI outputs. Network capability comes as standard on both models, along with a range of Audyssey audio technologies such as Audyssey Dynamic Volume and Audyssey DynamicEQ for enhanced performance. Finally comes the Denon DBT-1713UD Blu-ray transport designed to work specifically with the new AV receivers. It's a transport only, so plays back DVD-Video, DVD-Audio and SACD discs and delivers the digital signal unaltered through teh HDMI output to the AV receiver. The Blu-ray transport also supports 3D playback and streaming content such as YouTube or Netflix. 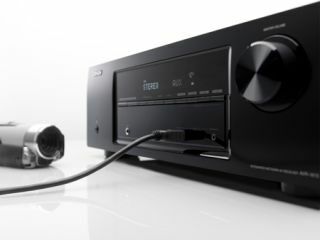 All the new AV receivers and Blu-ray transport are available now in a black finish.